Above is a current WIP...a bear stuffie that I had hoped was unisex enough to give away to either my pregnant cousin or a pregnant friend of Brett's. This bear actually worked up quite fast and hasn't given me any trouble crochet-wise, and hasn't aggravated my pregnancy carpal tunnel at all. Maybe it's because I have learned from my mistakes/frustrations in the past and have made my transition rows from small hook to larger hook loose. The only gripe I have is that I don't have much yarn left and I still have the rest of the body to do! If you look at the top left side of the picture you'll see part of the body. If you look on the other side of the head you'll see the pile of yarn that I have left. Definitely not enough to finish the project. Darn!! I was hoping one skein would be enough. 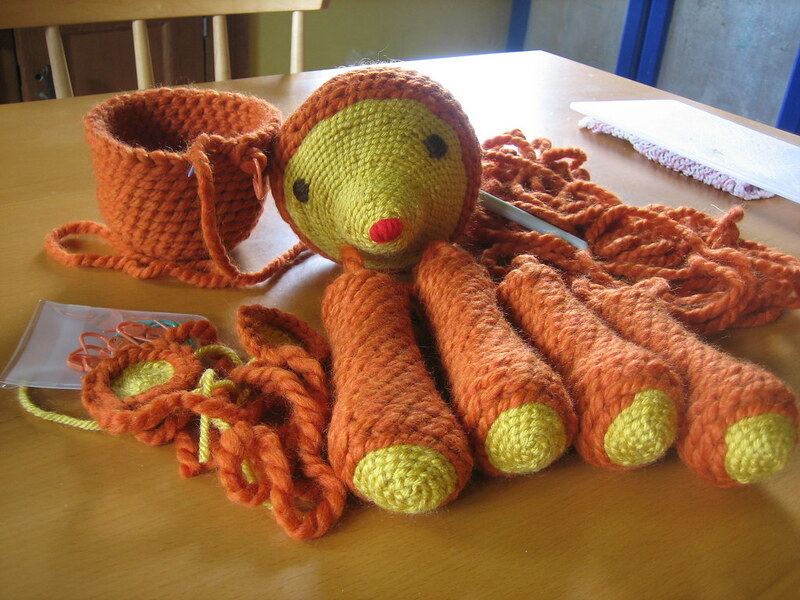 So I'm thinking of frogging part of what I have for the body now and adding a thick band of chocolate brown before finishing it off with a few rows of the orange. The brown will look like a shirt. At least I hope it'll look like a shirt. Either way, I don't think I'll be giving this stuffie away any more. If it turns out looking good, then maybe. I guess we'll see. In the meantime, I now have plans of crocheting another bunny in shades of pink for my cousin. I just found out yesterday that she's having a girl!! My plan was to crochet a bunch of unisex colored stuffies, with maybe a few gender specific ones thrown in, out of 3 pregnancies (all within weeks of each other too) one of us is bound to have a girl or boy and I can distribute the stuffies as needed. nice work! I want to learn to crochet one of these days so i can make cute little amigurumi! I'm a little intimidated to try to crochet a amigurumi...they are so small, I don't know if my carpal tunnel can handle it!! My friend bought me the cutest book for my birthday: Creepy Cute Crochet. Amigurumi of zombies and stuff. So cute!